While everyone plans to have a holly jolly holiday, the truth is that November and December are the prime months for stress. But these months, and the 10 others on the calendar, don’t have to be. Here are some ways to manage your day so that you can enjoy your family and the festivities. If the thought of setting your alarm any further back has you rolling your eyes, you’re not alone. Most Americans tend to rise between 6:30 and 7:30 a.m. But there are numerous benefits to tossing the covers back before the sun rises. One of the best reasons to wake early is to squeeze more productive time into your day. Try giving yourself an extra half hour to prepare for the day — even if you start incrementally. This jump-ahead will leave you feeling less rushed the whole day through. Take the time to make a list of all the things you have to do to get ready to walk out the door. Then further break down that list by chores you can delegate or outsource. For example, if you spend 30 minutes walking the dog, hire a pet sitter through the holidays to take this burden off your plate. Sites like Rover help you choose the perfect person for your dawn or dusk dog-walking duties. Cleaning is another responsibility that might be best handed over to the professionals so you can prioritize things that actually need your hands-on attention. Before you allow a stranger into your home, be sure to ask questions regarding costs, their personal and professional background, the types of insurance they hold, and the kinds of cleaning supplies and equipment they plan to use on your home. Don’t disregard older children when you start looking for ways to reduce the stress and strain of the holidays. Kids, even those as young as nine, can do much more than we give them credit for. Teens and tweens should have no problem making beds, scrubbing floors, washing windows, and doing the dishes. The ease of your morning is largely dictated by the actions from the evening prior. If you’re like most parents, waiting for your children to pick out clothes and put on shoes is a recurring frustration and one more hindrance you don’t need during the holidays. Take one afternoon – preferably a Sunday – and have everyone pick out clothes for the next several days. Before you do, however, think about activities and events you may have planned and, as Alexandra Evjen of Verily suggests, check the weather. Another way to streamline the morning is to have breakfast ready to go. Overnight oats, a make-ahead quiche, or muffins are all great options that won’t leave your tummy rumbling by noon. If one your primary sources of frustration for the holidays is not knowing where everyone is, there’s nothing wrong with downloading a family locator app to keep tabs on every member of your crew. When combined with a family calendar (Care.com recommends Google Calendar), not only will you know where everyone is, but they will have no excuses for showing up late for dinner. 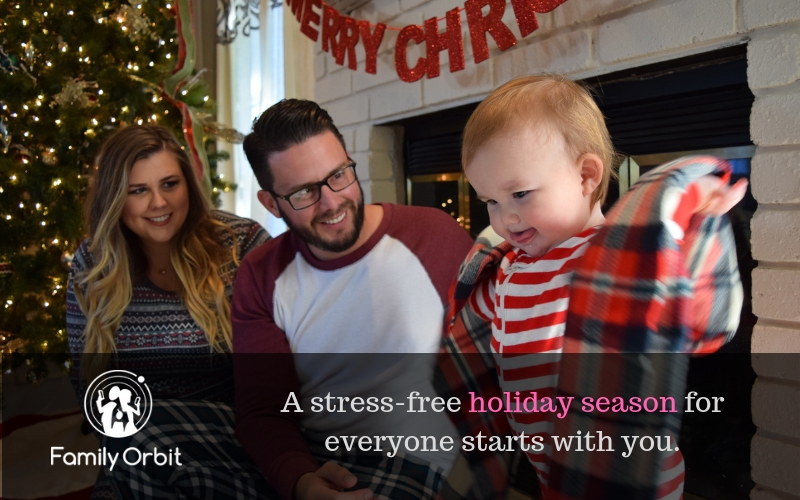 Most importantly this season, try to learn how to prevent stress from besting your every attempt at a happy holiday. Don’t get caught in the notion that you have to provide perfection for your progeny. You don’t. Remember, a stress-free season for everyone starts with you.